Our organization deals in offering Jute Silk Saree to our clients at affordable rates. We are devoted towards offering the qualitative range of Fancy Nylon Jute Saree, as per client’s precise need and requirements. Jute net many design of sarees available. 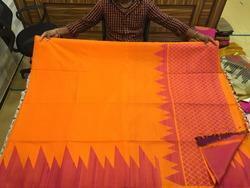 We have been successful in making our presence felt in the market by offering an elegant collection of Printed Sarees. These sarees are in wide demand in the market due to their excellent quality of fabric, flawless workmanship and tempting designs. Furthermore, we offer these products at market leading price. Fabric of this saree is very fine ..
Quality of jute is very good. Monica Jute Cotton Banarsi Saree, .